again loving tags for greetings. they are a bit more sturdy than a card so i think the recipient is a bit more inclined to hold on to the sentiment longer. this was a simple thinking of you type tag for a good friend. blue and chocolate have been cool colors for me for a while. the tag on this one was cut out of chipboard i had in my stash. 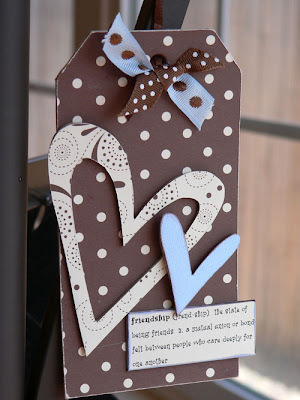 i don't usually buy chipboard tags, when they are so simple to make. i decoupaged the patterened paper to the tag. it is a better hold for when i sand the edges. same with the chipboard hearts. hard to tell in the photo, but the blue heart is edged in brown paint, same for the 'friendship' definition. patterened paper: stampin up: cardstock: stampin up; chipboard hearts: heidi swapp; word sticker: making memories; ribbon found in my stash. Enjoyed browsing and love your tags! I just saw that you tagged me. Thanks! I'll answer the questions tomorrow. I'm happy you enjoyed receiving your RAK. Also, I love your tag. It's beautiful. luv this colour combo, luv the tag as a card. this is just plain sweet! Love your color choices!